Compatible with Makita 18V Lithium-Ion batteries. Cordless Combination Hammer with Dust extraction system.DHR242 models are 24mm (15/16") Cordless Combination Hammers, featuring efficient Brushless DC motors with higher productivity than previous 18V Cordless Combination Hammers. 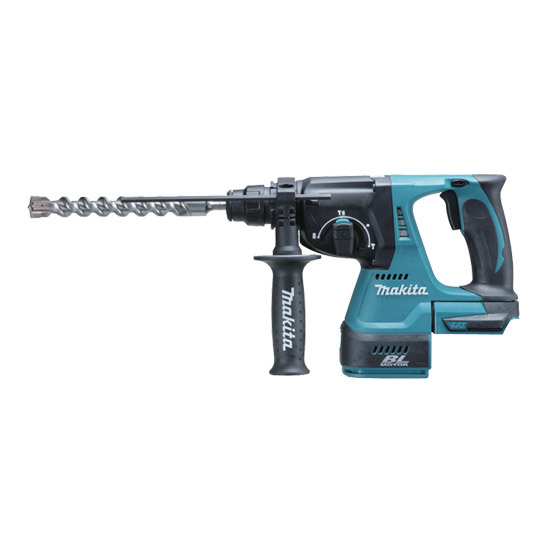 • Able to drill in concrete as fast or faster than 24V Cordless Combination Hammer model BHR200. • One touch slide chuck for SDS-plus bit. • Easy-to-grip handle ergonomically designed to: give maximum power thrust and provide a sure and comfortable grip in any operation; overhead application, drilling with palm-up or palm-down grip. • The tool body is seperated into the upper and lower housings at the foot of handle portion where the houses are jointed with vibration absorbing cushion rubbers. • Unique rubber joint construction suppresses the transmission of vibration to battery terminals, minimizing battery failures such as terminal breakage or poor electrical contact.